To be honest, I’m still not ready to talk Cleveland Indians offseason. The conclusion of the World Series, now officially eight days old, was such an emotional roller coaster, and I figured to need at least a few months to get myself to a spot to discuss baseball again. However, sometimes certain team news and rumors can speed up the process a bit. At least that’s the case with the latest buzz about the Indians and their potential hot stove plans. A few pundits have kicked around the idea of Cleveland trading one its postseason heroes. Though it’s solely a rumor at this point, the idea of the Tribe dealing reliever Andrew Miller is seen by many as much more possible than you’d think. If this is indeed the case, there are more than a few reasons why I’d encourage the Indians to think long and hard before even remotely considering such a move. Let’s get the obvious out of the way right now – I get why other teams would come calling about Cleveland’s best relief pitcher. Miller became a household name through the Indians’ playoff run, looking superhuman at times. He finished the postseason with an astounding 30 strikeouts in 19.1 innings pitched, and was a big reason why the team made it as far as it did without several key players. Additionally, his being under contract through 2018 easily raises his appeal across the league. So, sure, it behooves Cleveland to at least field calls from teams asking about Miller. That said, the Indians have a lot to consider before letting any talks advance beyond tire kicking. 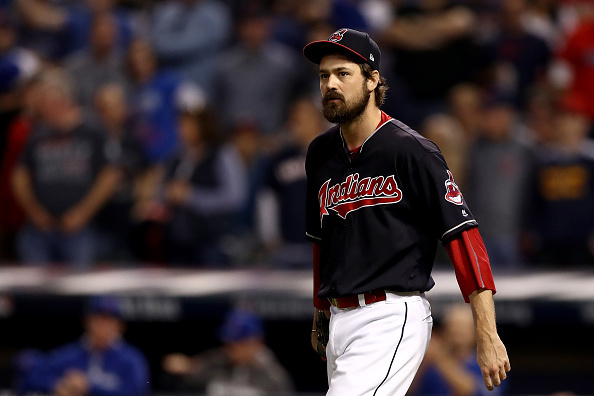 The most obvious has already been stated – Miller may or may not have single-handedly saved Cleveland’s pitching situation this postseason. One of the reasons the Indians were able to survive with a makeshift rotation and get to within one run of winning the World Series was because of what Miller contributed from the pen. The fact his team-friendly contract goes for another two seasons is a big benefit for Cleveland, too. Quite frankly, it was the main reason the Tribe coveted him in the first place. Knowing that netting any big-name reliever was going to require the Indians to pony up significant prospects, they wanted to at least ensure they weren’t just landing a rental. With that in mind, it’d be a bit strange for Cleveland to get the guy it wanted all along, parting with two of its best prospects in exchange, then deal him at the end of his first season with the team. Now, obviously this all comes with a bit of a caveat. While I’m incredibly hesitant to consider the idea of Cleveland trading Miller, there’s always room for a team offering a can’t miss deal. Again, the reasons for clubs coveting Miller are easy to explain. Because of this, there’s always the potential for someone to come in with a potential trade which would make the Indians significantly better, offering high-quality players who would be under contract for a while. In all honesty, this is the only situation where I would consider dealing Miller. It would have to be a trade which would make the departure of a reliever who became a citywide icon in October, who struck fear in the hearts of opposing batters, seem easy to take in. Dealing Miller is something which would result in significant backlash from fans, unless of course the returns are so good they can’t be turned down. Outside of this scenario, though, it’s difficult for me to accept the idea of trading Miller. The reasons the Indians wanted him – adding supreme, team-controlled talent to the bullpen – seem to clash with the concept of dealing him away. Because of this, Cleveland better know what it’s doing when it comes to any talks it has with clubs coming after Miller.